Biofilm containing Alteromonas sp. 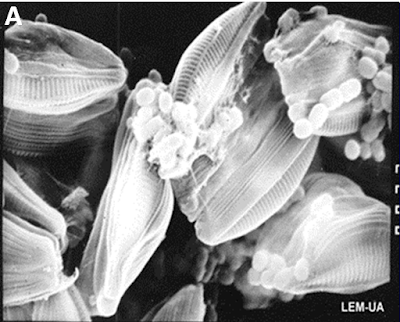 and diatom Navicula incerta, from Rivas & Riquelme (2012). The Alteromonadaceae are a group of marine gamma-Proteobacteria defined on phylogenetic grounds. Characters (from Ivanova & Mikhailov 2001): Gram-negative, rod-shaped bacteria. Motile by single flagellum, sometimes sheathed, occasionally forming lateral flagella, fimbria or other sheath-like structure. Not forming endospores or microcysts; sometimes forming capsules. Requiring Na+-ions for growth; sometimes capable of growth in media containing 15% salts. Chemoorganotrophs; oxygen used as electron acceptor. Aerobic or facultatively anaerobic. Usually not denitrifying; arginine dehydrolase absent. Usually utilising glucose, fructose, not utilising mannose. Major isoprenoid quinone usually Q8. Major fatty acids i15:0, 16:0, 16:1 (n-7). G+C content of DNA ranging from 35–50%. [DH03] Donachie, S. P., S. Hou, T. S. Gregory, A. Malahoff & M. Alam. 2003. Idiomarina loihiensis sp. nov., a halophilic γ-proteobacterium from the Lo‘ihi submarine volcano, Hawai‘i. International Journal of Systematic and Evolutionary Microbiology 53: 1873–1879. [GH01] Garrity, G. M., & J. G. Holt. 2001. The road map to the Manual. In: Boone, D. R., R. W. Castenholz & G. M. Garrity (eds) Bergey’s Manual of Systematic Bacteriology 2nd ed. vol. 1. The Archaea and the Deeply Branching and Phototrophic Bacteria pp. 119–166. Springer. [HH03] Hugenholtz, P., & T. Huber. 2003. Chimeric 16S rDNA sequences of diverse origin are accumulating in the public databases. International Journal of Systematic and Evolutionary Microbiology 53: 289–293. [IT03] Inagaki, F., K. Takai, H. Hirayama, Y. Yamato, K. H. Nealson & K. Horikoshi. 2003. Distribution and phylogenetic diversity of the subsurface microbial community in a Japanese epithermal gold mine. Extremophiles 7: 307–317. [IM01] Ivanova, E. P., & V. V. Mikhaylov. 2001. A new famil, Alteromonadaceae fam. nov., including marine Proteobacteria of the genera Alteromonas, Pseudoalteromonas, Idiomarina, and Colwellia. Mikrobiologiya 70 (1): 15–23. [KI03] Kobayashi, T., C. Imada, A. Hiraishi, H. Tsujibo, K. Miyamoto, N. Hamada & E. Watanabe. 2003. Pseudoalteromonas sagamiensis sp. nov., a marine bacterium that produces protease inhibitors. International Journal of Systematic and Evolutionary Microbiology 53: 1807–1811. [RU03] Romanenko, L. A., M. Uchino, E. Falsen, N. V. Zhukova, V. V. Mikhailov & T. Uchimura. 2003. Rheinheimera pacifica sp. nov., a novel halotolerant bacterium isolated from deep sea water of the Pacific. International Journal of Systematic and Evolutionary Microbiology 53: 1973–1977. [YH03] Yumoto, I., K. Hirota, Y. Sogabe, Y. Nodasaka, Y. Yokota & T. Hoshino. 2003. Psychrobacter okhotskensis sp. nov., a lipase-producing facultative psychrophile isolated from the coast of the Okhotsk Sea. International Journal of Systematic and Evolutionary Microbiology 53: 1985–1989.